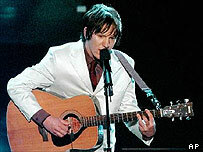 US singer-songwriter Elliott Smith has died, it has emerged. The 34-year-old passed away on Tuesday, his publicist confirmed. Smith had battled drink and drugs and is thought to have committed suicide. Smith released five lo-fi folk rock albums, including the critically-acclaimed Either/Or and XO in the 90s. His song Miss Misery earned an Academy Award nomination after it was included on 1997's Good Will Hunting soundtrack but Smith had no UK hits. The Los Angeles county department of the coroner's office confirmed the death of a man called Steven Paul Smith, the singer's real name. He had sustained a single stab wound to the chest that appeared to be self-inflicted. Born in Omaha, Nebraska, Smith began his musical training at the age of nine and began writing and recording as a teenager. He became a cornerstone of the indie-rock scene in Portland, Oregon, released three albums with his band Heatmiser before going it alone. Playing all the instruments on his 1996 solo debut Roman Candle, it featured the dark lyrics that would become his trademark. Smith's material tackled difficult subjects such as his own unhappiness, his drug problems and heartbreak. He garnered modest commercial success and inspired a cult following in the UK. The musician released his final album Figure 8 in 2000, the second for major US label DreamWorks Records. Partly recorded at London's Abbey Road studios, it was reminiscent of The Beatles and The Beach Boys. Smith also recorded a version of The Beatles' Because which was subsequently included in the film American Beauty. He was working on new album From a Basement on the Hill at the time of his death.